“If people knew the healing power of cannabis, everyone would be growing it in their patios,” says a patient who has found relief from pain. SAN JUAN, Puerto Rico — Lirio Rivera, 62 and a grandmother of five, admits she's an unlikely convert to the virtues of marijuana. Rivera, who describes herself as a conservative and religious homemaker, grew up believing "mafú" — a word for pot — was a dangerous drug and stayed away from it. That changed after Rivera found relief from the chronic pain and fatigue caused by fibromyalgia by using capsules containing cannabidiol, or CBD, an active component of marijuana that does not cause a high. In 2015, a year before leaving office, then-Gov. Alejandro Padilla legalized medical marijuana by executive order after a series of public debates. Two years later, the legislature voted it into law and Gov. Ricardo Rosselló signed the legal framework for its use. According to the island's medicinal marijuana page, around 72,000 patients have signed up for the program run by the Department of Health. The office's goal is to register 100,000 new patients by the end of the year. “It’s a new industry with a lot of exciting opportunities,” said Puerto Rico’s pot commissioner, Antonio Quilichini, executive director of the Puerto Rico Cannabis Program and Regulation Board. According to the government, companies, doctors, patients and workers who have paid fees for cards, permits and licenses to consume, sell, cultivate, transport, prescribe and manufacture have added $11.5 million to the island's cash-strapped economy, which is still recovering from Hurricanes Irma and Maria in 2017 and a crushing $72 billion public debt. The government has issued 77 dispensary licenses and 40 have opened across the island. The government and industry proponents project that the cannabis program could generate $100 million in new tax revenue by 2020 and create 20,000 jobs. As the industry has ramped up in the last two years, some have pointed out that the projections depend on enrolling a lot more patients so that the island can generate revenues from the sales taxes and the increasing number of growers and sellers have a solid consumer base. Medical marijuana proponents say that growth is happening. Grammy-winning singer and songwriter Draco Rosa, who co-wrote the Ricky Martin hit, "Livin' La Vida Loca," is a passionate user of medicinal marijuana. He's one of the many investors and celebrities putting money and resources into the industry. “This thing works. It’s the real deal," said Rosa, who has survived cancer twice, in 2011 and 2013. He credits medical cannabis with greatly helping him during his treatments. “You can’t run from the haunting of cancer, but you can at least live more at ease so that your body can heal." His experience inspired him to create his own medicinal marijuana line with the highest possible concentration of CBD. To do so, he teamed up with NextGen Pharma, the island’s first and largest medicinal marijuana company. “I approached the cannabis lines in the way I produce music — with a lot of love and attention to quality and detail,” Rosa explained. In December, Rosa released his first product called Monte Sagrado (Sacred Mountain), also the name of his new album, and it is aimed at cancer patients and people suffering from chronic pain. In February, the married father of two released a second medicinal line, Mad Love, for patients suffering from anxiety and stress; products include edibles and oils. “The chocolates son super ricos (delicious), it’s all dulce amor (sweet love)," he said. Other celebrities, including musician Julian Marley, sell CBD products in Puerto Rico. NextGen Pharma, which has the largest cannabis operation in Puerto Rico, has invested $6 million in building new headquarters, increasing their staff and expanding manufacturing. “People are looking for alternatives to chemicals that have secondary side effects," Carmen Serrano, CEO of NextGen Pharma, told NBC News. The same group of investors founded Bwell, a line of dispensaries. To date they've opened four establishments in tourist-heavy areas like Old San Juan, Condado and Ocean Park as well as in Guaynabo and are scheduled to open six more by the end of the year. Puerto Rico is able to honor tourists' medical cards from any U.S. state where medical cannabis is legal, Serrano said, which puts the island in a good position to sell. Medical marijuana is still classified as an illegal substance, so financial institutions shy away from offering services to the nascent industry. Banking is the biggest challenge, according to Julian Londoño, vice president of the Puerto Rico Medical Cannabis Association and a managing partner at NextGen Pharma. Tu Coop, the one local credit union providing financial services to the medical marijuana industry, had to cancel accounts in January after Banco Cooperativo, a larger bank handling the credit union's transactions, no longer accepted their checks. But the problem was solved after Tu Coop took Banco Cooperativo to court and a judge ordered the larger bank to reinstate the credit union's accounts. 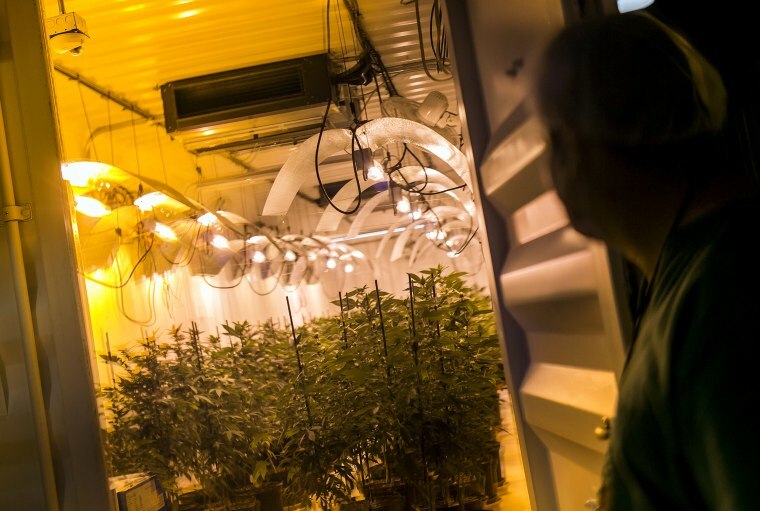 Still, Londoño said one of the toughest hurdles facing the industry is that medical marijuana is essentially a cash business, which he described as cost prohibitive and labor intensive. "Imagine having to count, recount, bag and transport a $40,000 monthly tax bill in cash?" he said. Lawmakers in the House are expected to vote on the SAFE Banking Act, which would allow legal cannabis businesses to use federal banking institutions and alleviate the tensions between federal and local governments trying to regulate legal marijuana. Apart from banking issues, informing the public and law enforcement about medicinal marijuana is a constant challenge. “There is still a lot of education that has to happen at the ground level with police officers,” Serrano said. Quilichini, the island's pot minister, agrees. “We are constantly in discussion with law enforcement and district attorneys. There is still a lot of confusion with what is legal, what is not,” he said. Some patients like Rivera say that while they have greatly benefited from medicinal marijuana, they have to keep an eye on costs. Medicinal cards cost $25 each, but with doctor visits to get a prescription, the average cost can climb to $80 to $100. Dispensaries sell everything from $10 edible cakes to $80 viles of capsules. Despite the issues, proponents tout the growing number of patients, growers and dispensaries and the enthusiasm around the industry. “Puerto Rico has the talent, expertise, climate and infrastructure to make this industry work,” said Jason Ortiz, vice president of the Minority Cannabis Business Association, based in Connecticut. The group aims to ensure more minorities are part of the growing cannabis industry. For her part, Rivera is still shy about telling some of her friends she uses medical marijuana. She's afraid there's still a stigma attached. That doesn't stop her from being a fan. “But to be honest, I still can’t believe that marijuana is what has finally helped me live a more normal life,” she said.